It gave the victory to the Barça with a doublete waiting for more signings and brilliance. Before failing a penalty (stopped Pacheco) and then threw the crossbar once. Paulinho made his debut. While waiting for the signings that cauterize the hemorrhage by the march of Neymar to land, Barça remains what Messi has. For good and bad, the Argentine is there, leading a team that, for the moment, Has fulfilled his first goal in the League, which was none other than to reach the first set of selections with six points in the wallet. 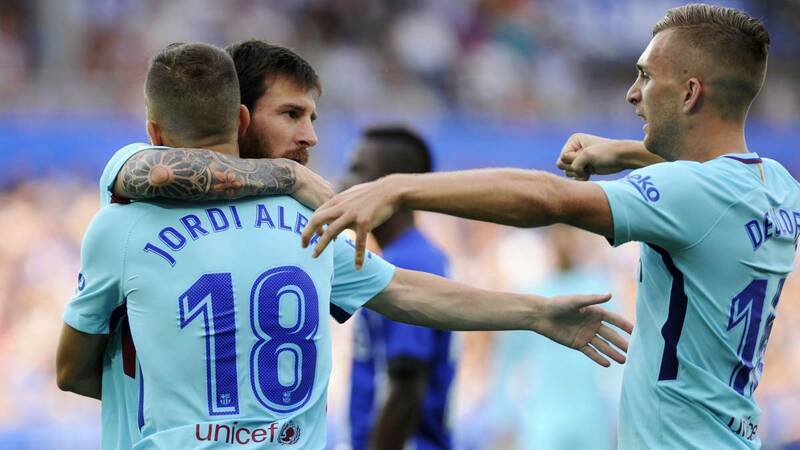 Ganó the Barça by 0-2 in Vitoria to the Alavés in an ugly encounter in which Messi began failing a penalty and that ended up deciding with two goals and did not the triplet because it returned to shoot the rail. It takes four shots to the stick in two days, a missed penalty and two goals. While having the fortune to face, I would take seven goals in two days. Messi is always on guard. There is more slate Barcelona that I play. And that's because there are more ideas than football players to carry them out. Live the set of Barcelona in a subsistence economy that is strange to the culé fan, more accustomed to aesthetics than to practice. But for now, this is what there is. If you have to play before the Alavés with Deulofeu and Aleix Vidal as extremes (front unthinkable only a few months ago) as he faces. Luckily, there is always Messi. Vist the drawing and alignment of Barcelona in Mendizorroza, the question for The fan was clear: who will score the goals? The answer was clear as well. Or Messi or anyone. And Messi scored even though it cost him horrors to enter the match. As almost always facing a record, Leo's engine seems to make the pearl. He started the League missing a goal to reach 350 and shot three times on the stick in the first day and in the second scored a penalty (very strict Ely on Piqué) that Pacheco stopped in a superb stretch. But the Argentine He does not give up, luckily for Barcelona, ​​and in a match that was getting complicated as he advanced, Leo pulled the car at the worst. The first part was characterized by a tactical dominance of Barcelona that Pacheco, the stupendous goal Of the local team, was enough to conjure. He even stopped the penalty to Messi and gave arguments to his followers to believe in the surprise. El Alaves, lived on the counter-blows and the fight of Ruben Sobrino, that in speed portrayed a few times to the central Barcelona, ​​but fought too much. In the second half, wear made a dent in an Alava that not He had neither the strength nor the resources to exploit the circumstance that Barcelona finished the first half with three of their four defended defenders. Nor is it that Barcelona kept too much gunpowder on the bench to win the game, but as on the grass was Messi , The Catalan set ended up imposing itself. First in a move of the Argentinean in which he won the position to the central after play by Alba and then in a counterattack miserably driven by Alcácer that the Valencian had the courage to fight to recover the ball and serve the second both Argentine Which still has the entity pending it. In sports and social. Tras 0-2, the hostilities ended and the meeting ended with the symbolic debut of Paulinho entering the field by a very faded Iniesta. Messi, still had time to go to Hers and shoot again at the stick. The Argentine defends the strong and for now is enough, but if neither reinforcements arrive nor he, will be able to withstand the siege.